1. Download Virtual Audio Cable. Author's website: http://software.muzychenko.net/eng/vac.htm#trial or using direct link on our site: http://dl.djsoft.net/vac413.zip. 2. 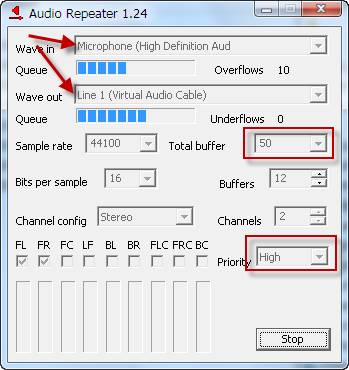 Start Audio Repeater: Start->All Programs->Virtual Audio Cable->Audio Repeater (MME). Wave out: "Line 1 (Virtual Audio Cable)"
It's also recommended to change buffer size to minimum and set the "High" priority (to decrease latency). In Skype, select the microphone you're using and output device: "Line 1 (Virtual Audio Cable)". Device: "Line 1 (Virtual Audio Cable)"
Now, when you click "MIC" button in RadioBOSS, you'll hear the Skype conversation. When there's no Skype call, just microphone will work. If you don't want to hear yourself while speaking, the setup is a bit more complicated. Thanks to wutzthedeal user (TruthOnTapShow: http://www.facebook.com/TruthOnTapShow), we have the instruction on how to do it. Install VAC, set two cables, set up three MME repeaters by opening three instances of it; run Mic to Line 1, Line 2 to Line 1, then Line 2 to headset. You should NOT be hearing your own voice echo, nor the caller their voice. In Skype or Google Voice (or similar) Set input to mic and output to line 2. I would advise unchecking any automatic adjustments within your voip program. In RadioBOSS, go in and set input to Line 1. Check the output to encoders only (I did this and I think it's required; will correct if wrong, but it works this way). Don't tick push to talk if you plan on talking a lot; that would require you to hold the "mic" button down during your broadcast from the main screen. Also, DON'T FORGET to turn on the mic by tapping that button on the main screen. Since you won't be able to see your mic input bouncing up and down on a meter until the newer version of RB comes out, just download the free app Pin It, and pin the Mic to Line 1 repeater window open, which will "stay on top" and serve as a voice input meter so you know if there is a sudden problem. Calls and music sound clean and crisp. This looks like a really solid program. If this works it'll be the best thing since sliced bread as it's just what i was looking for.. thank you and will try it out on next broadcast.. There are other "virtual cable" programs - you can try Google to find those. But Virtual Audio Cable is the best one IMO. Do you hear yourself when MIC button is not pressed ion RB? If so, disable microphone playback in the sound card settings. Tested two hours. I hear what I speak and I also hear what skype caller speaks. The problem is that RadioLogger records nothing from skype, but Total Recorder does. That's intriguing. What source did you select in RadioLogger? In case of Line.In - it just records what's on that input, it can't remove Skype conversation from it. Auto Mix - is it some sort of Stereo Mix on Windows XP? It depends on sound card what will be recorded through that input and RadioLogger doesn't have control over it. Does this work the same way in 4.9 Dmitry? Yes, generally it's the same. In RB 4.9 the Mic/Line.In settings look different, that's the only difference. Yeah, I did it this morning and switched from the cable the mic was running on to the line the speakers were running on and played YouTube in the background and it broadcasted it on the station.